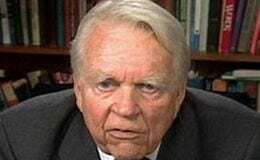 Andy Rooney Retiring from "60 Minutes"
Andy Rooney will announce on Sunday’s “60 Minutes” that it will be his last regular appearance on the broadcast. He will make the announcement in his regular essay after a segment in which Rooney looks backs on his career in an interview with Morley Safer. It will be his 1097th original essay for “60 Minutes.” Rooney wrote the first of these essays, a piece entitled, “An Essay on Doors,” in 1964. Rooney, 92, began his run on “60 Minutes” in July 1978. His first essay for the broadcast was about the reporting of automobile fatalities during Independence Day weekend. He became a regular on the show that fall. In his first full season as the “60 Minutes” commentator, the broadcast was the number one program for the first time.